The pecan is a delicious nut tasting slightly sweet. This native American tree nut is a member of the hickory family and it grows in a limited number of countries. Pecans are a good source of copper, critical for energy production in cells. 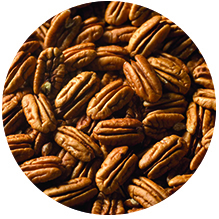 Pecans are packed with fatty acids, such as oleic acid that the body needs. Pecans are used in the bakery, confectionery and dairy industry, in chocolate and ice cream. Pecans are also added to cereals, breads, pastries and cookies, and are popular in salads as toppings on desserts and as a snack.